What is the attitude you are going to use ? What their biggest problems ? What do you want to achieve by your presentation ? After you answer those question, write the content, split it into small parts and prepare relevant pictures. 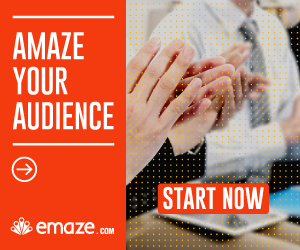 Emaze allows you to create unlimited presentations for free. Enter Emaze website and sign-up free by entering your Email and password. Note: I recommend to check out Emaze pro features because they are critical for some people (like watching presentations offline and making them private). There are 5 template types on Emaze website: Presentation, Mini site, E-card, Game, Visual story. You can check out here a detail explanation about each one of them. If you want to create a business presentation, choose business category, if you are a teacher and you want to create presentation for your students, choose education. After choosing a category, choose your favorite template. You can see a preview of the template before choosing it. When you are reaching the presentation editor, click on ‘Add’ for adding slides. Add only slides that fit to your presentation. You can add pre-made slides and empty slide as well. Change the content as you wish. In order to make it easy for you and others to identify the presentation, give a meaningful name to your presentation.